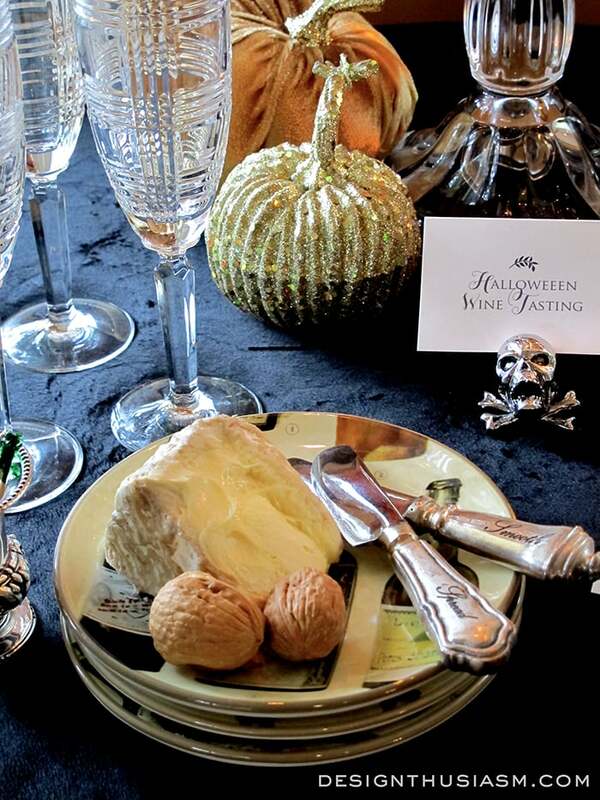 Often people associate Halloween with kids, but some of the best Halloween festivities are for adults. 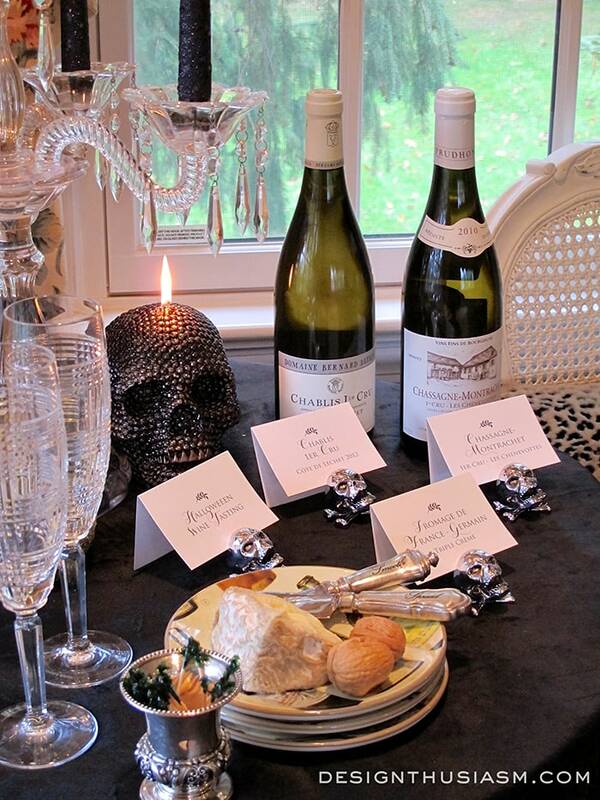 Here, I’ve set a table for a Halloween wine tasting, with lovely French wines, DIY labels and skull place card holders. 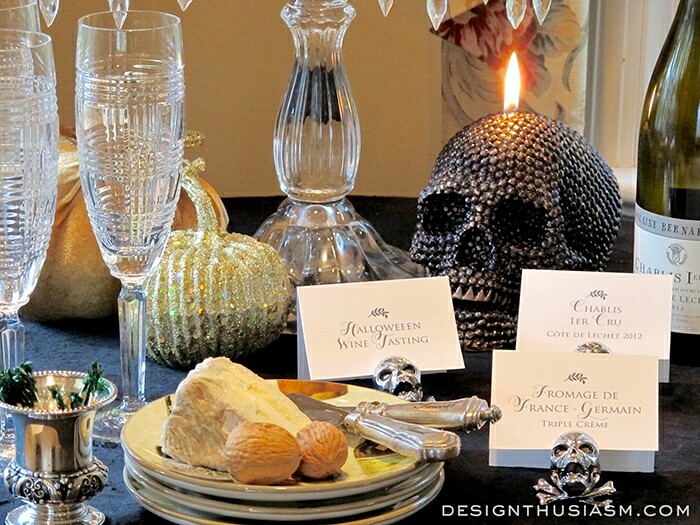 The beaded skull candle is from Pottery Barn, as are the card holders. 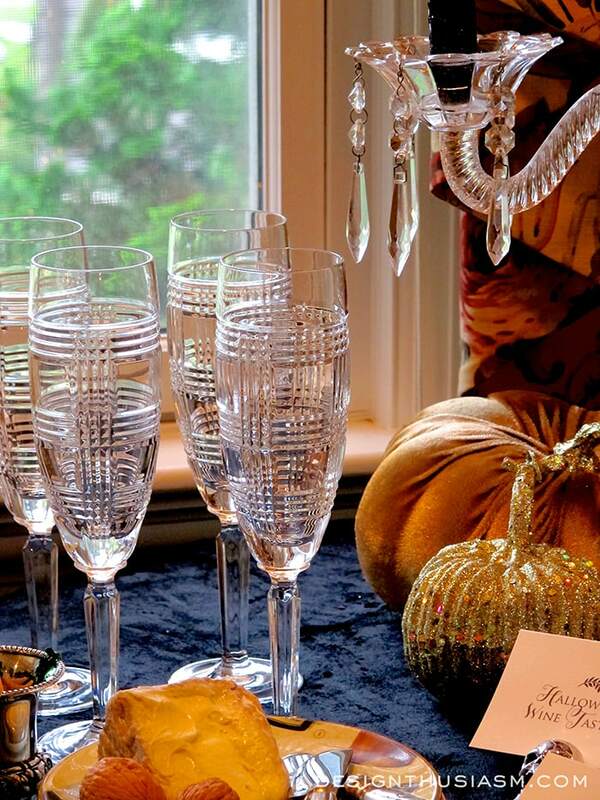 The black velvet throw used as a tablecloth is from Home Goods, champagne flutes are from Ralph Lauren Home and velvet and glitter pumpkins, as well as glimmer black tapers are from Michaels. 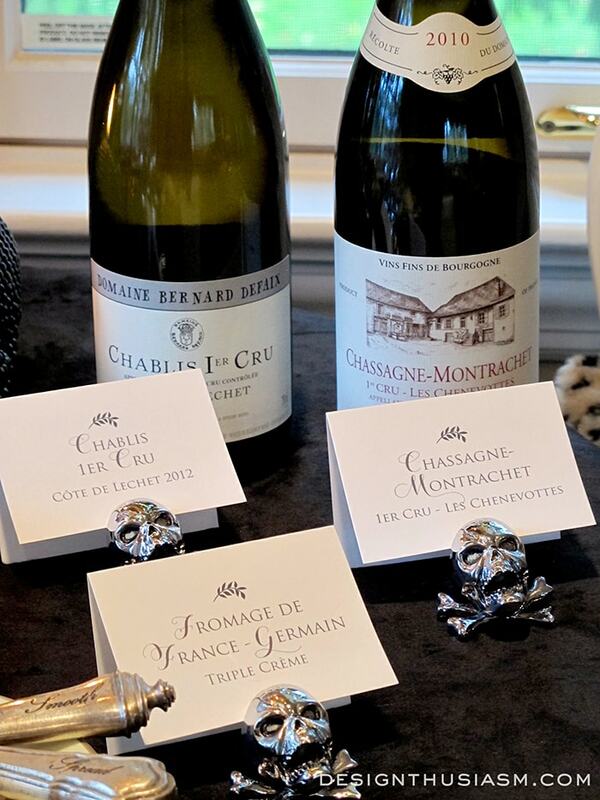 The toothpick holder is antique silver found at a London market and the wines are white French burgundy. 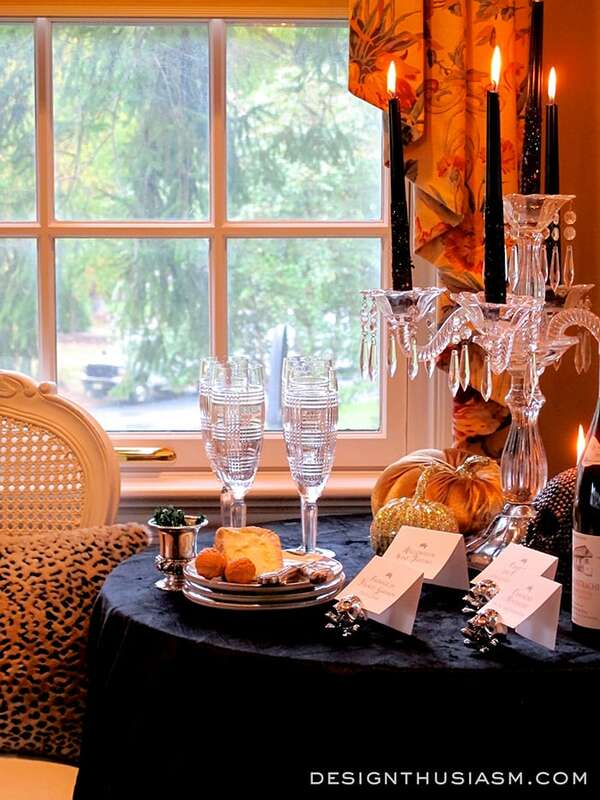 A delightful evening is prepared with not a piece of candy corn in sight. Enjoy! 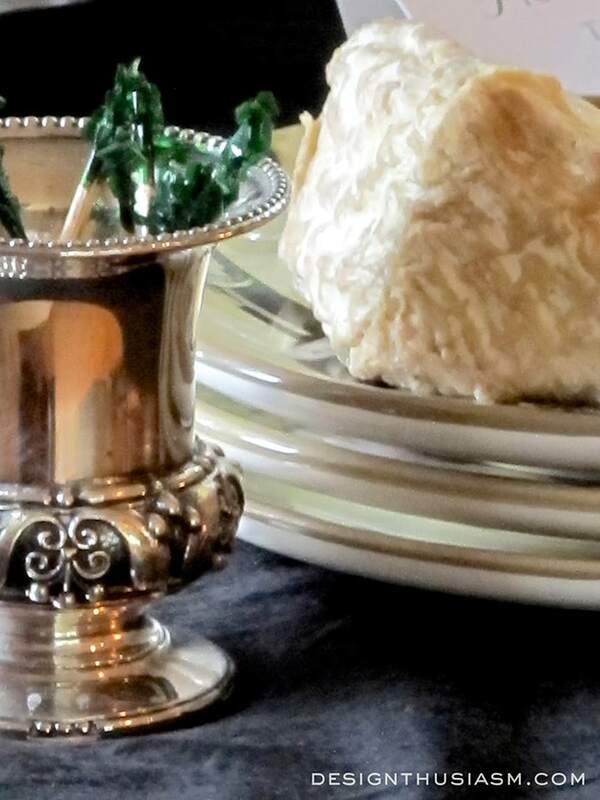 Linking with Metamorphosis Monday, YourDesignsThisTime, The Scoop, Inspire Me Tuesday, Twirl and Take a Bow, Wow Us Wednesdays, Tablescape Thursday, From My Front Porch to Yours, Home and Garden Thursday, Feathered Nest Friday, Show and Tell Friday, Silver Pennies Sundays. lovely!! 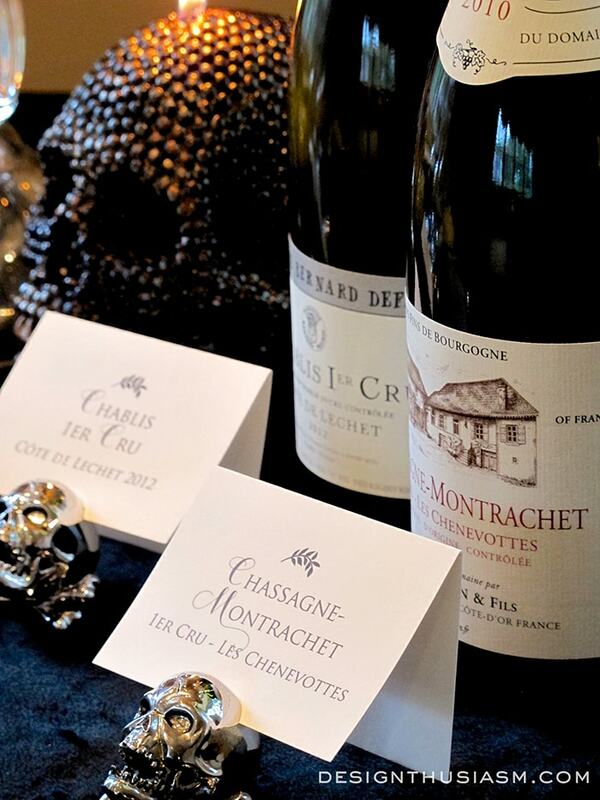 do you have a source for those skull placecard holders? they are awesome! 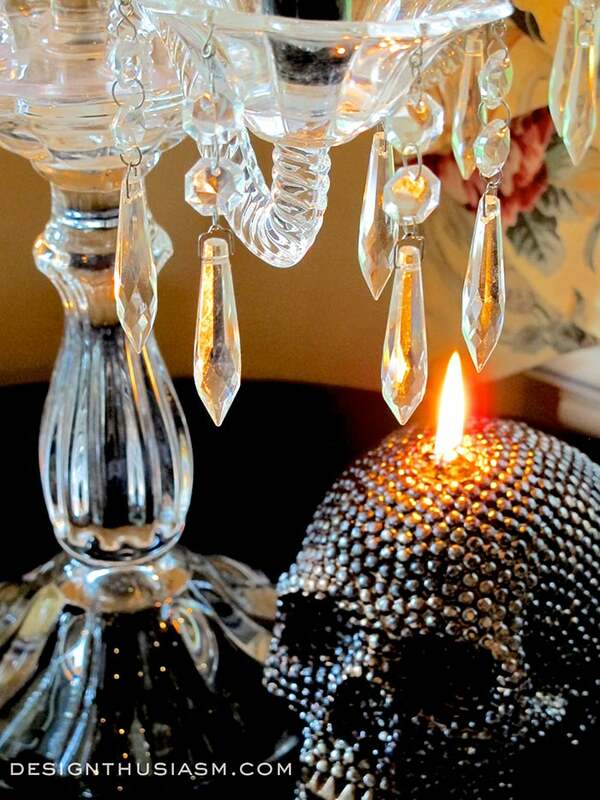 Looks like so much fun…love the candelabra. Those stems are lovely! 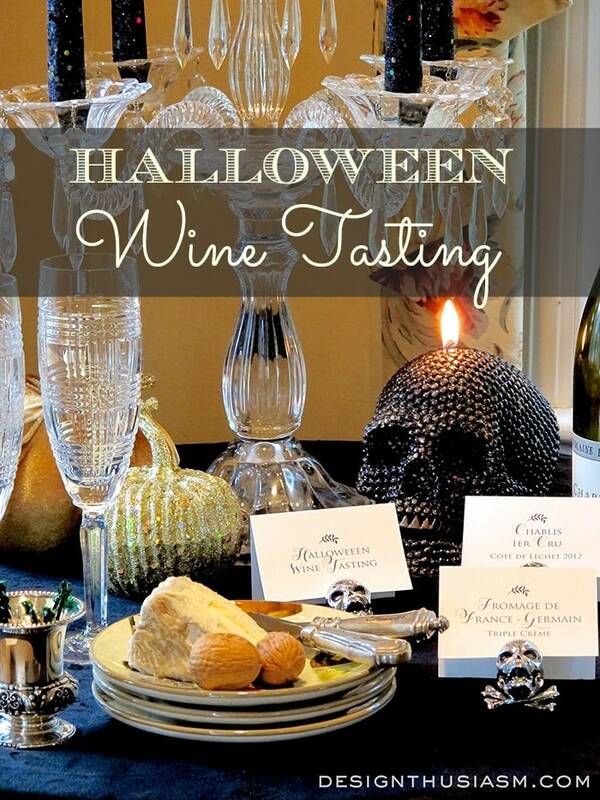 Now, that’s my kind of Halloween party! Everything looks fabulous! 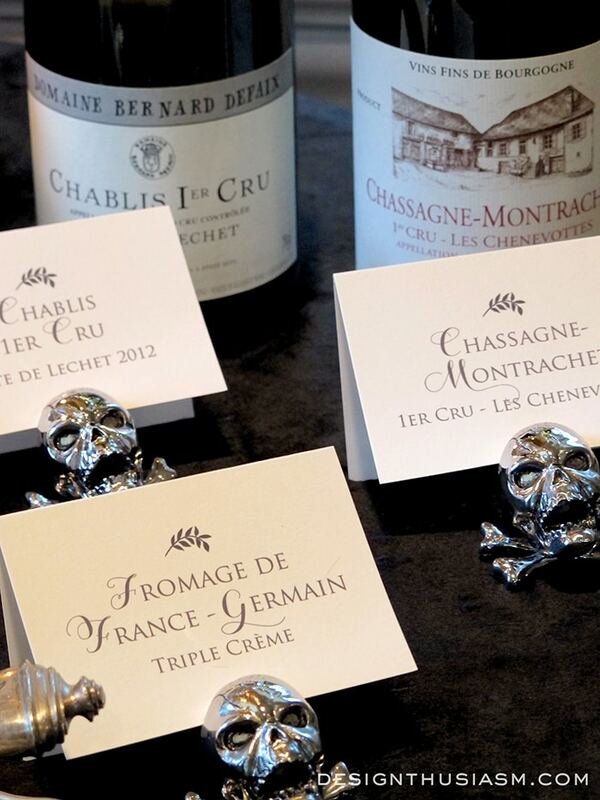 Would love to try that wine and cheese and savour the surrounding décor! What a gorgeous setting, Lory! 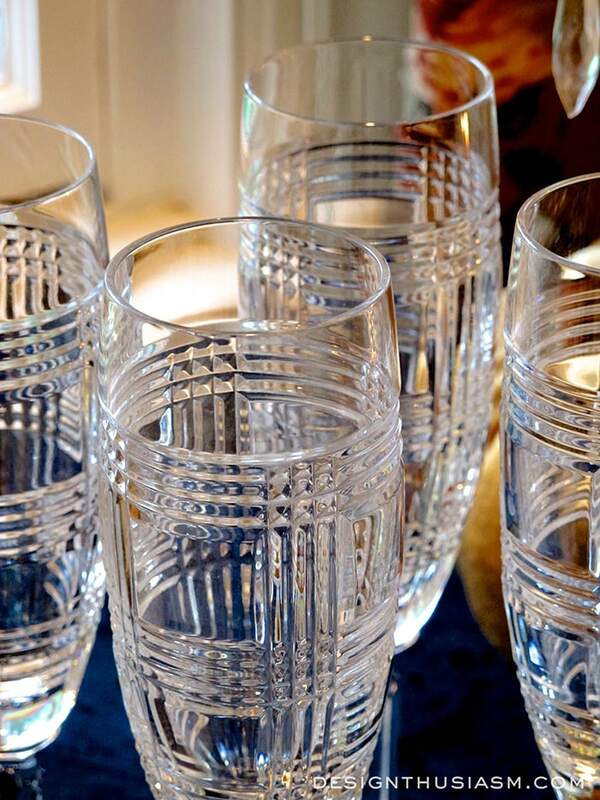 Love the Glen Plaid flutes! One of my favorite patterns from Ralph Lauren. Fabulous seems like such a frivolous word to describe this setting, Lory! Oh, my gosh…it’s stupendous! I love, love, love it!!! Ha ha! Me too… about the wine!! 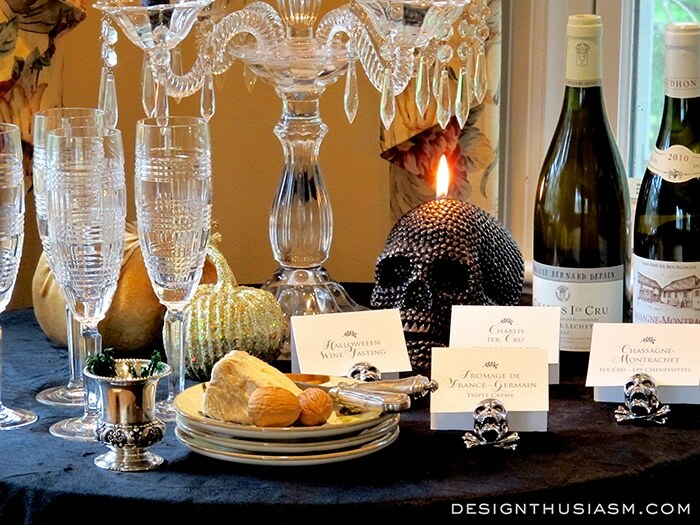 This is a great idea and I’m loving this ‘elegant’ Halloween theme!! 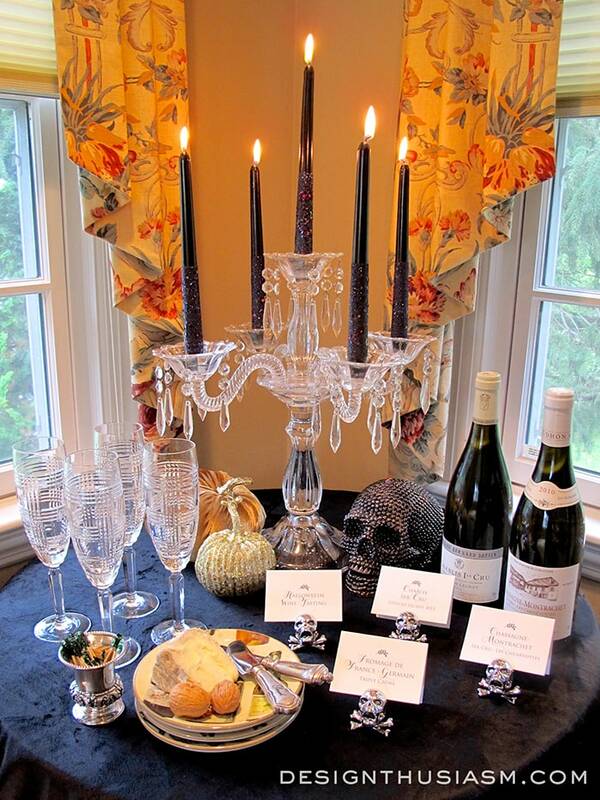 That stemware and the candelabra are gorgeous!! 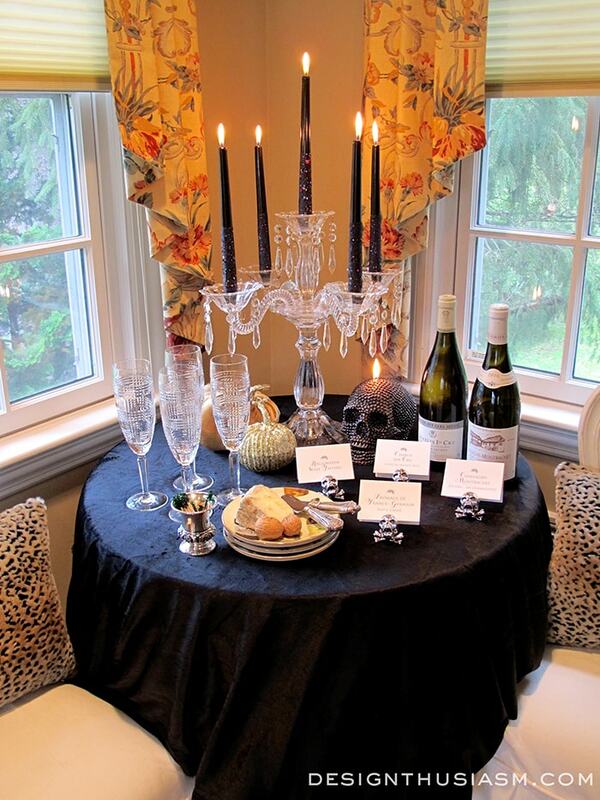 Oh I love this idea, my idea of how to celebrate Halloween. 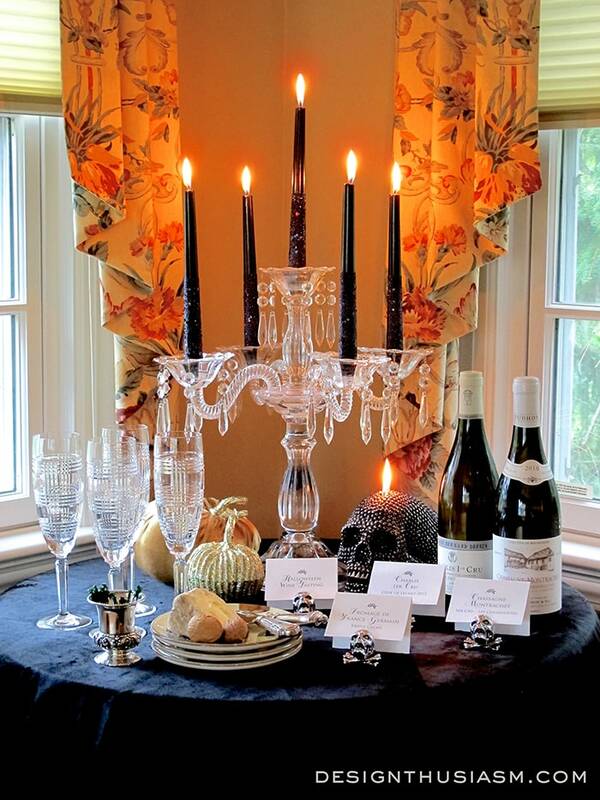 Love your table and that sconce is stunning. Thanks tons for linking to Inspire Me. 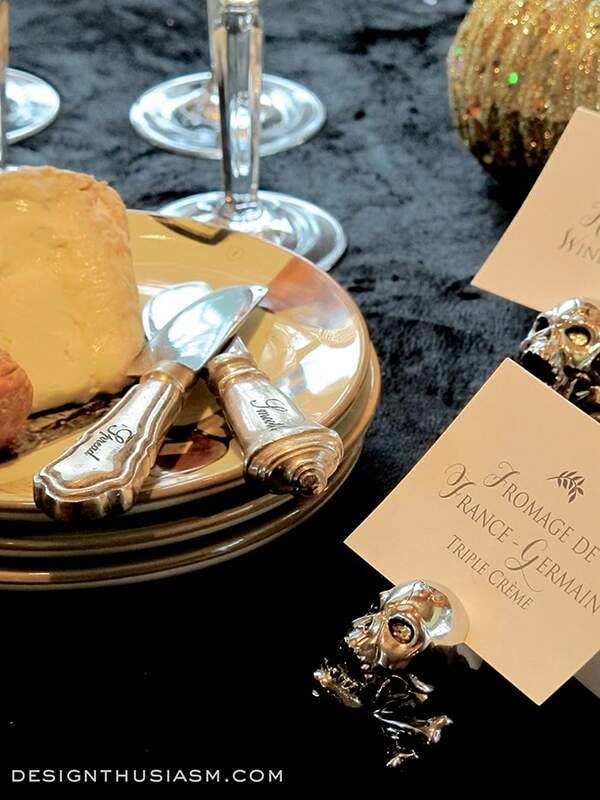 Very posh and I love, love, love the stemware!